In order to encourage more young voters to take part in the political process, Government of India has decided to celebrate January 25 every year as ‘National Voters’ Day’. 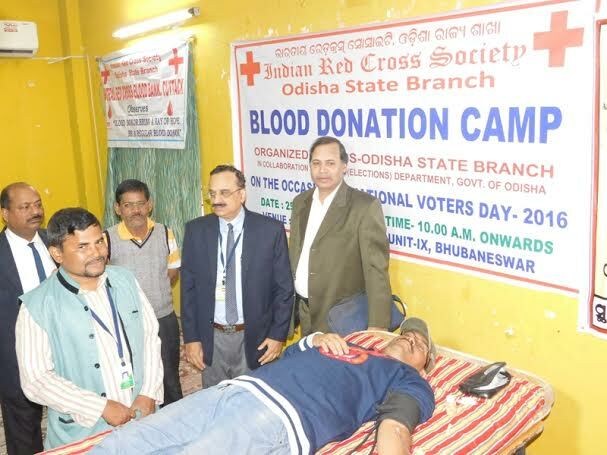 To mark this occasion on January 22, Indian Red Cross Society, Odisha State Branch has organized Blood Donation Camps at Red Cross Bhavan, Bhubaneswar in association with State Chief Electoral Officer, Odisha and Aama Kalakar Paribar, Bhubaneswar. In this Blood Donation Camps 33 no. of donors has donated their blood after proper examination. The Blood Donation Camp was inaugurated by Dr.D.N. Gupta, Chief Electoral Officer, Odisha, Sri B.P. Ray, Deputy Electoral Officer, Odisha and Dr. Chakradhar Panda, Honorary Secretary, Indian Red Cross Society, Orissa State Branch & Dr. Benudhar Satpathy, Blood Bank Officer, Central Red Cross Blood Bank, Cuttack. Dr. Gupta said that the moral reason to donate blood is to get the joy of saving a life and the scientific reason is it keeps the donor healthy and Dr. Chakradhar Panda added to motivate more youths for blood donation for the cause of humanity. Besides, Sri Govinda Chandra Mahunta, Honorary Joint Secretary & Sri Kahtu Charan Biswal, Under Secretary, IRCS-OSB coordinated the programme and Smt. Gourimani Biswal assisted in this Blood Donation Camp.